Do you remember the song “Africa” by Toto? If you are of a certain age, of course you do. Picture this: it’s 1907, and we’re listening to Toto at my apartment in Haverford (please don’t ask why). I get into a deeply heated argument with Brian Minier over the lyric “Kilimanjaro rises like a leopress above the Serengeti”. Note the spelling? It’s obviously a female leopard (although the lyric is ridiculous, obviously. In what way would a mountain “rise”? Do female leopards “rise”?) He insists the band is referring to a female leper. Really, Brian? Really? So when I see Kilimanjaro, looking a bit like melting vanilla sundae, out the window of my ridiculously tiny Cessna (the safari version of the shuttle bus), that lyric gets stuck in my head, and I get indignant all over again. I mean, who would differentiate between male and female lepers anyway? But, as usual, I digress. Because, while most people go on safari and want to see blah blah leopards blah blah rare rhinos blah blah lions nom-nomming on something, I am on the hunt for something else. I want to be the one nom-nomming on something. I am looking for nyama choma. “Nyama choma” is basically a cooking term referring to grilled meat — frequently goat, but also beef, pork, mutton, what have you. As is the case with grilled meat of any persuasion, nyama choma is delicious — as seen by the numerous stalls selling it roadside. But for some reason, people don’t seem to believe you want to eat African food. Typical menu offerings at these lodges are “fresh-out-of-the-bush” concoctions like beef carpaccio, roasted pumpkin soup, and grilled fish with Hollandaise sauce. 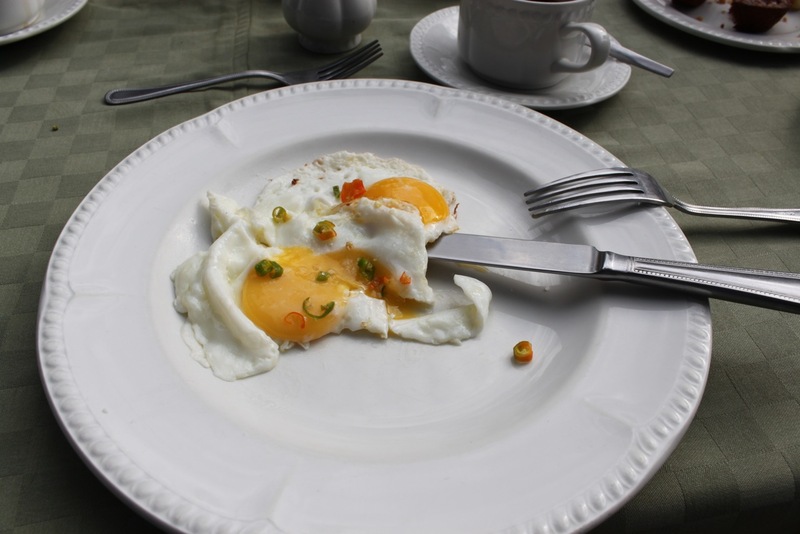 Nice stuff, but some people want to experience new countries through their stomachs, too. The folks at Singita Sasakwa (www.singita.com), where I first stay, are kind enough to indulge a few requests. One, suggested by my friend James, is “masala fries” — a perfect colonial fusion of Anglo-Indian influences. 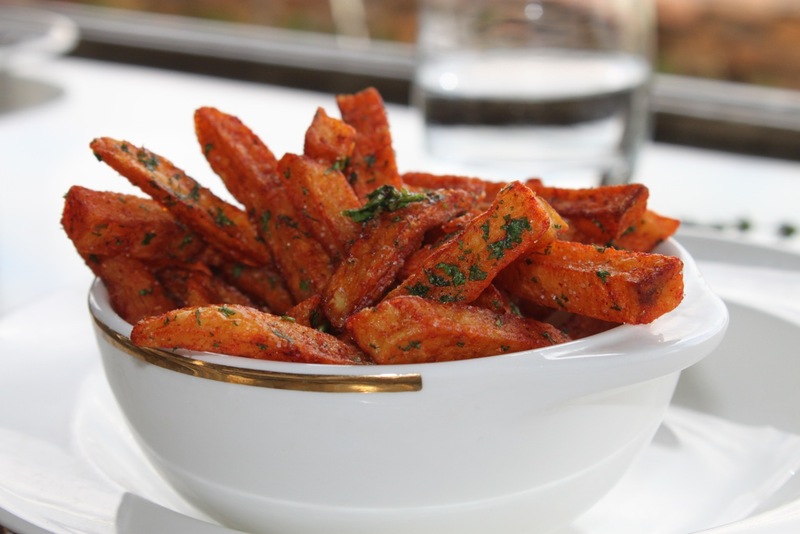 They are like junk food, they are so good: crispy fries, meaty within, coated with a tangy, salty spice coating of masala and dusted with a bit of parsley. There is no reason why this shouldn’t be in every vending machine in every corner of the globe. I have to figure out how to make these at home. They also indulge us with an “African tasting menu” that includes some things I’ve never seen: ugali, maize cooked into a solid mass that resembles glue, meant to serve as the backdrop for everything else; mchicha, a Tanzanian curry of spinach and peanuts; mishkaki, skewered, impossibly tender beef; maharage ya nazi, kidney beans stewed with coconut cream; “coconut rice”, cooked a la risotto, but with coconut milk instead of broth; and a sort of kachumbari that they appear to call chachandu, a tomato-chili relish served alongside grilled tilapia. Of course, it blows everyone away. Why is there not more of this? At Governors’ Private Camp in Kenya (www.governorscamp.com), we get more English-y stuff the first night — chicken fillet in mushroom gravy and an impossibly tall tower of fluffy mashed potatoes that I cannot help but eat all of — but Patrick and Frank, our stewards, are more than happy and even a little tickled to accommodate a request for nyama choma. 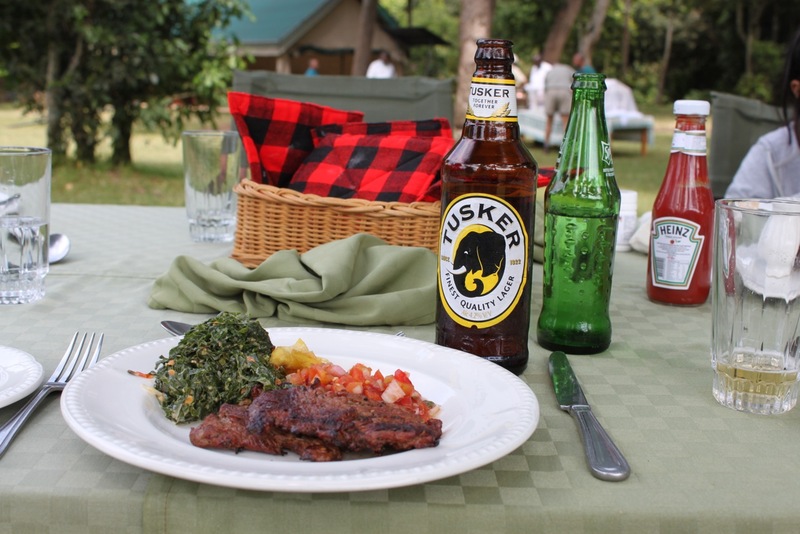 The next day they outdo themselves, grilling up strips of beef slathered in a parsley-and-onion speckled kachumbari. 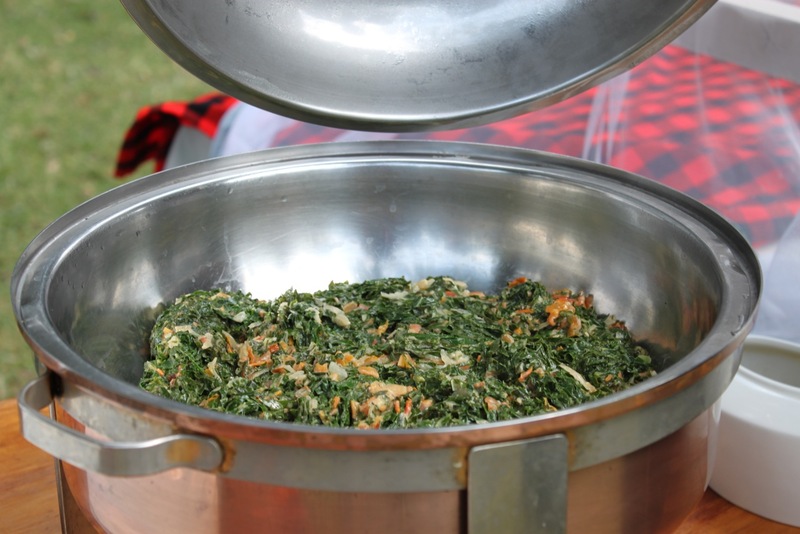 They also serve up heaping spoonfuls of sukuma wiki, a Kenyan staple dish that literally means “to push the week” and comprises braised, shredded greens studded with bits of tomato, cooked until it falls apart and finished with a bit of cream. Although I’ve had some indifferent versions of this dish, the one here is made with lots of love, “the traditional way”, Patrick tells us. The next few days are a blur: githeri, a stew of kidney beans and corn, sweet and filling; matoke, made from stewed plaintains in a sweetened tomato-and-onion sauce; mandazi, crispy, giving dough “dumplings”, slightly sweetened, reminiscent of the Thai patongko. Our camp manager Colin tells us that South Africans eat a version of mandazi that is stuffed with mince, another smart Anglo-African fusion dish. If I ever go to South Africa, I am trying that immediately. But I miss home. I rediscover chilies. Although they are a bit bigger and not as spicy as the prik ki nu (bird’s eye chilies) back home, I remember that it was the Portuguese who were supposed to have brought chilies to Thailand, and that these suckers were probably the ones they brought. So in a way, I have a bit of home at every meal, sprinkled on my fried eggs or tucked into my curries. Enough to tide me over until I get back. The Glutton travels with her stomach. A great read as always, with lots of new dishes to try vicariously through you! Thanks Liz! Karen is with me now and we are thinking of you. I’m all in favor of a masala fry experiment. Glad you got the masala chips. I’m obssessed with them. Yours at singhita looked a bit dry though. I hope they were juicier in real life. Also glad the chefs got into choma-ing you the nyama… that’s more kachumbari than I’ve ever seen in one place – YUM :-). 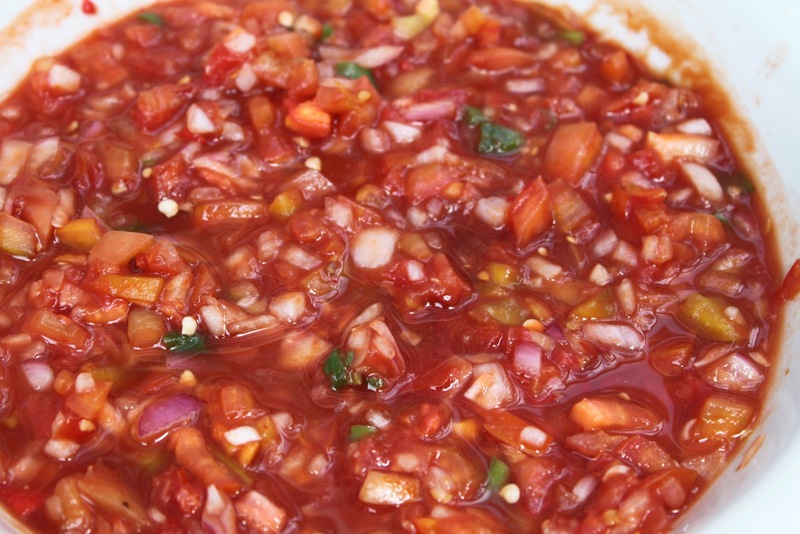 You even got matako! Err … I mean matoke! Bravo! Really? I’ve Only seen them dry like this…they were good though. They served them with ketchup and mayo. Do you think they misunderstood me and created something completely new and different? Brian thought it was a Leper too? I thought that was my mistake/joke. Holy moly, safari sounds delicious. Are there camps where you hunt your own meat? Agree with Dwight about the great photos! Thanks! I am trying to emulate your fab photog skills. Dear and Very Fortunate Glutton…. what a lovely time you seem to be having African style…. we have been to the cricket matches in South Africa where locals carry in their braais to cook up various meats… the whole place smells wonderfully of barbeque and the atmosphere is so friendly and celebratory. already trying to figure out a way to return to that continent. I think the food is really underrated. So jealous. All of this looks and sounds awesome. I know you and Mark will have some extra stuff to chat about next time you meet. Also some great photos in here, props to the photographer. One complaint tho… the intro needed a mash potato style shot of Kilimanjaro. Thanks! But when I had the opportunity to shoot Kilimanjaro, I was too preoccupied with holding onto my seat for dear life. Sorry!